I thought a lot about how I would approach this review. I could rave about all the things that make it so wonderful, but that would be boring and there’s enough of that out there already. I could pick it apart, pointing the plot implausibilities or how some of the effects don’t hold up so well, but that would just be cheap and contrarian. 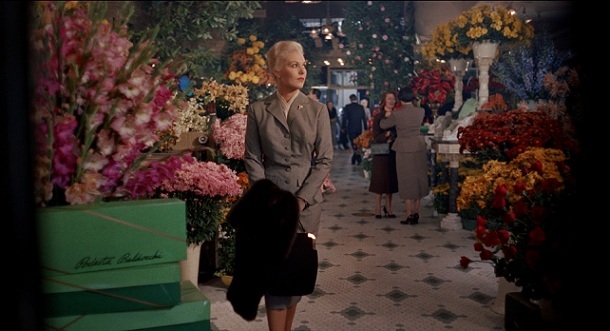 I could do a light-hearted piece about something like how Kim Novak looks so much better as a brunette than a blonde, but I just did light-hearted for Rear Window. Instead, I think I will simply bypass the review and take this opportunity to do my 2012 Sight & Sound poll post. Yes, I know I’m a little late. Everyone else made their S&S posts months ago, when it was hot news. So sue me. Of course, it’s relevant here because the big story of the poll was that Vertigo finally unseated Citizen Kane from the top spot. Long overdue, in my opinion. For too long, Kane has borne the burden of “The Greatest Movie Of All Time”. Now it’s Vertigo‘s turn. And a sad burden it is. The IMDb message board for the film shows numerous “overrated” posts from the past few months. Sigh. It’s inevitable, though. With so many great movies, it seems criminal to pick out one and call it the best. But that’s misreading the poll. It’s not like an authoritative body of experts all came to complete agreement about the best one. It’s simply the one that the most people considered one of the best. It shouldn’t be taken as unassailable doctrine, nor should anyone make the mistake of thinking it’s intended as such. It’s just… math. As for the replacement, it aligns with my personal tastes. Vertigo is in my personal top 100, Kane isn’t. The other thing about the poll that got some attention is the dustiness of it. Nothing from the past 40 years is in the top 10 of the critics poll. I consider this a good thing. Not because newer films aren’t deserving, but because it means that consensus hasn’t coagulated around a select few movies yet. Opinions on recent films covers a much broader spectrum, reflecting broader tastes. Who knows… perhaps by the time the 2022 poll rolls around, the gaps between the “best” films on the poll will be much smaller, as votes get spread around more. It’s the lower end of the poll that’s far more interesting anyway. 8 1/2 and 2001 – These numbered films are both in my top 100. Obviously, no objections here. The Man With a Movie Camera – A former top 100 pick for me, and one I still hold in very high regard. The best surprise of the poll. Tokyo Story – I like it quite a bit, but I always thought it was odd that opinion seems to coalesce around this one, when to me it doesn’t seem to stand head and shoulders above plenty of other Ozu films. The Searchers – The only film in the top 10 that I outright dislike (though there are several others throughout the top 250). Again, I need to revisit it and am willing to admit that my initial reaction involved some knee-jerking. Its presence here isn’t doing much to spur me to rewatch it, however. This entry was posted on December 11, 2012 at 9:26 pm	and is filed under Movie Reviews. You can follow any responses to this entry through the RSS 2.0 feed. You can leave a response, or trackback from your own site.